In December 2012, HSBC USA Inc. and HSBC Holdings plc. 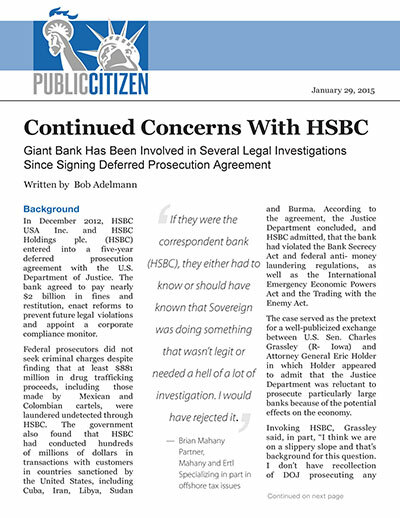 (HSBC) entered into a five-year deferred prosecution agreement with the U.S. Department of Justice. The bank agreed to pay nearly $2 billion in fines and restitution, enact reforms to prevent future legal violations and appoint a corporate compliance monitor. Federal prosecutors did not seek criminal charges despite finding that at least $881 million in drug trafficking proceeds, including those made by Mexican and Colombian cartels, were laundered undetected through HSBC. The government also found that HSBC had conducted hundreds of millions of dollars in transactions with customers in countries sanctioned by the United States, including Cuba, Iran, Libya, Sudan and Burma. According to the agreement, the Justice Department concluded, and HSBC admitted, that the bank had violated the Bank Secrecy Act and federal anti- money laundering regulations, as well as the International Emergency Economic Powers Act and the Trading with the Enemy Act. The case served as the pretext for a well-publicized exchange between U.S. Sen. Charles Grassley (R- Iowa) and Attorney General Eric Holder in which Holder appeared to admit that the Justice Department was reluctant to prosecute particularly large banks because of the potential effects on the economy. Holder responded: “… the concern that you have raised is one that I, frankly, share. I’m not talking about HSBC here, that would be inappropriate. But I am concerned that the size of some of these institutions becomes so large that it does become difficult for us to prosecute them when we are hit with indications that if we do prosecute – if we do bring a criminal charge – it will have a negative impact on the national economy, perhaps even the world economy. I think that is a function of the fact that some of these institutions have become too large. As part of the agreement, HSBC agreed to forfeit $1.26 billion, pay $665 million in civil penalties and enact reforms to ensure compliance with U.S. federal laws. The judge overseeing the HSBC case required the bank to appoint and cooperate with a compliance monitor, who was tasked with evaluating the company’s implementation of the deferred prosecution agreement.7 The agreement said that the criminal investigation into HSBC could be reopened if the bank fails to fully comply with the agreement. Loretta Lynch, the U.S. attorney for the Eastern District of New York, signed the deferred prosecution agreement with HSBC.9 In November 2014, Lynch was nominated to succeed Holder as attorney general. Her confirmation hearings began on January 28. But more than two years after the deal was announced, there is evidence that the systemic changes that Lynch promised may not be materializing. Since it signed the deferred prosecution agreement, HSBC has been caught up in numerous legal inquiries and has paid several fines for misconduct. In some cases, the misconduct in question appears to predate the deferred prosecution agreement. But in several cases, it appears more recent. HSBC’s compliance monitor, Michael Cherkasky, was scheduled to submit a new annual review of the bank’s compliance with the DPA to the Justice Department on Jan. 20, 2015. “Prosecutors have said the report, a synopsis of which is expected to be published in April, will focus on HSBC’s private banking and trade-finance businesses, as well as its operations in six locations including Malaysia, Hong Kong and the U.S.,” the Journal wrote. The Journal wrote that HSBC is working on upgrading its computer systems and reported that the bank has hired “several thousand compliance staff,” but said that might not be enough to satisfy Cherkasky, citing comments from a profile the paper wrote in July 2014. Correspondent banks provide services on behalf of another financial institution, and perform functions such as accepting deposits from the other institution. Correspondent banks are often used to conduct business with banks in foreign countries. Sovereign’s website, “www.offshore-protection.com,” lists 12 financial institutions, including HSBC, with which it offers bank accounts. The Justice Department press release suggested that the main targets of its inquiry were U.S. taxpayers who availed themselves of Sovereign’s services to avoid paying taxes.23 However, HSBC’s decision to offer correspondent bank accounts for Sovereign is concerning. Brian Mahany, a former state revenue commissioner and assistant attorney general in Maine who now has a private law practice specializing in part in offshore tax issues, wrote a pair of items on the Sovereign inquiry on his blog, Due Diligence, subsequent to the Justice Department’s announcement. Sovereign’s descriptions of its products on its website read like a playbook for evading detection by regulators. “Debit cards have become a very popular way to access offshore funds. Having a debit card linked to your account can be a great convenience, but can be dangerous since your privacy can be compromised because the card can be sourced back to your bank account to which it is linked,” the firm’s website says. Public Citizen contacted Mahany to ask his opinion on whether HSBC, as a provider of correspondent bank accounts for Sovereign, should be viewed as an unwitting conduit to the company’s alleged tax evasion services or a complicit partner. Sovereign’s description of its practices “raises not just one red flag but dozens of red flags,” Mahany said. In November, a Belgian investigating judge in November 2014 charged HSBC’s private banking unit in Switzerland with helping Belgians avoid “several hundred million euros” in taxes through a fraud and money-laundering scheme. A statement by Belgian prosecutors said HSBC’s private banking unit in Switzerland had engaged in “serious and organized tax fraud, money laundering and unlawful exercise of the profession of financial intermediary” from 2003 to the present. On January 27, the United Kingdom’s Financial Conduct Authority (FCA) announced that HSBC was one of eleven financial institutions that had agreed to pay compensation to customers for selling them “unnecessary” insurance to cover fraudulent credit card usage. The FCA wrote in a press release that the insurance “was unnecessary because the customer’s card issuer was typically responsible for any transactions” after the customer reported the card stolen or missing. The Daily Mail reported that the banks had been selling insurance offered by Affinion, a company based in the United States, and that any customers who purchased these products between Jan. 2005 and August 2013 would be eligible for compensation. The government’s decision to offer HSBC a deferred prosecution agreement was remarkable in light of the egregious acts the bank had engaged in. To the extent that the agreement offered a silver lining for the public, it was that it promised to compel HSBC to enact reforms that would prevent the bank from acting wrongfully in the future. The contents of this report suggest that the bank may have a long way to go to deliver on that promise.